We've been in Stockholm less than 24 hours and already I've noticed it has at least 2 things in common with San Francisco--hipsters and food. I have to say I've never so many dudes with beards, tattoos, skinny jeans and funky floppy haircuts, they are everywhere. 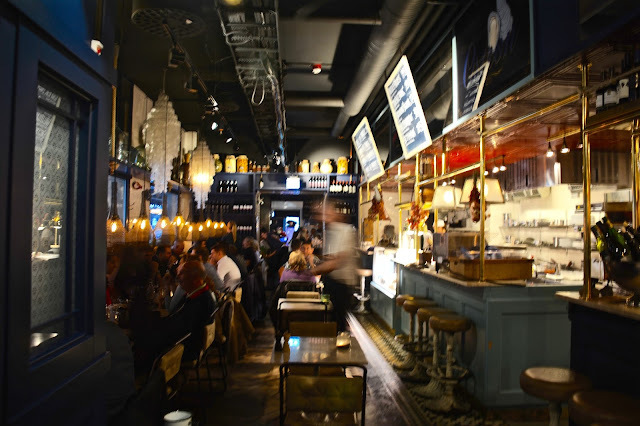 Many of the restaurants we've walked past also have the same kind of look--wood or stone tables centered around a main bar with lots of clean line steel and reclaimed looking wood accents--it's a trend around the world it seems. On our first night of searching for food we tried a place that was recommended to us by a dude at an ice bar (yes, a bar made of ice. We went for the cheesiness of the experience) but they were packed and booked. That dude then recommended a place around the corner that seemed popular as of late. We walked the block over and found it was 20 minutes for a table so we decided to just drink at the bar and wait. Why not, we are on vacation. It's was called Fiskbaren. The name is Swedish for fish beef. It's a long space with lots of wood tables and wood things. The front of the restaurant is a butchery, then you enter into a narrow room with an open kitchen where they cook the meat that is designed around meat things--like what you'd see in a butcher shop. The next room is the fish room with another open kitchen where they cook the fish things. It has marble tables and a bar with brass fixtures and lamps made of mesh that look like fishing nets. Kind of a theme restaurant while still hitting the stylistic high notes of whats popular these days. The staff are all really thin folks with lots of tattoos, facial hair, floppy hairdos and achingly thin--it's that look and it seems if you are a guy you need to have it to work here. 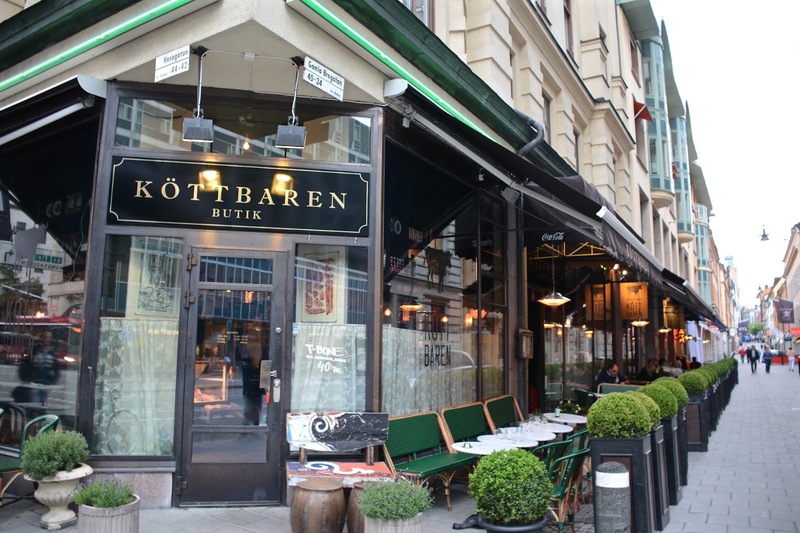 (Yes there were women working here, but they could have blended into the everyday crowd--seems there isn't a hipster look for women in Stockholm). The picture above was taken at a little before 10pm. Sun sets around 11pm so it was still bright outside but for whatever reason the inside of the restaurant was darker light wise than out, go figure. It made it really hard to take photos. See below, where we sat on the fish side. All food is brought in fresh daily and mains are posted on chalkboards (top left) above the kitchens. One has all that days meats and the other fish. They don't do any entrees that combine the two so we ended up getting one of each. They do have a set appetizer menu of small bites that span both fish beef and we decided to start with the Chef's tasting app platter. It's pretty much a small bites, like two at the most, of 5 of their appetizers as chosen by the chef. The menu descriptions were a little vague as was the server so here's what we got from left to right (I'm pretty sure). Beef carpaccio with black pepper, garlic mayo aioli and possibly shredded parmesan. Tender, lots of garlic notes of pepper it was pretty decent. Tuna with chili flaked aioli. This one must have been a one off as it wasn't listed on their starter menu. Not being the biggest fan of raw fish I tried it anyway with the sauce and well, the sauce was loaded with chili and very hot so it pretty much killed the taste of the fish and whatever else may have been on here. Probably just as well for me. Buffalo mozzarella with beefsteak tomato, avocado puree and a basil leaf. Pretty much a caprese salad with that avocado addition instead of olive oil or salt or pepper. Meaning it didn't have too much flavor going on. Toast skagen--shrimp salad on toast with a sprig of dill. We both liked this one the best. Nice fresh shrimp, mayo, dill, crunchy bread. I could have had a full portion of this and it was the best of the bunch. Foie gras with ginger and plum. A little sweet and salty going on here, though there was barely enough of the foie gras to get a taste for it as the plums were like a jam and severely sweet thus taking over the flavor profile of this small bite. 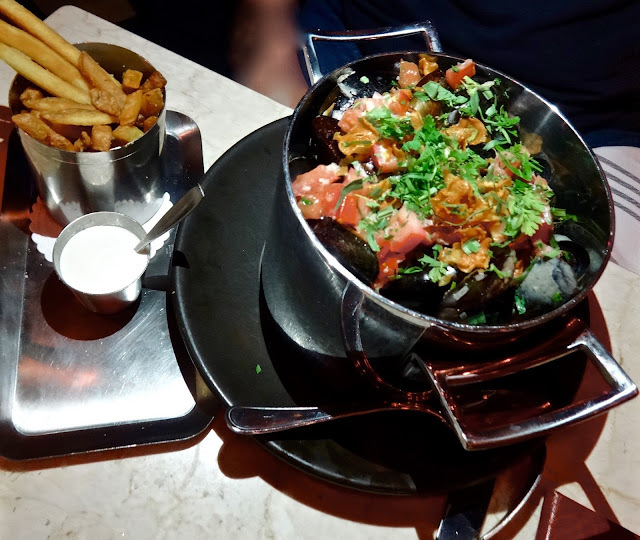 Moule frites--mussels and fries. We all know this dish in San Francisco, it's a favorite on many a menu. It's not very different here. The fries are a little thicker and crispier and the dip is a garlic mayo cream, very nice done well. The mussels are in a giant pot and there are LOTS OF THEM. I mean the pot is deceiving in just how many are in there. The top is a mix of crispy onion flakes, parsley and tomatoes. The broth is a light thin cream based one with garlic, tomatoes and onions. The mussels were cooked just right--tender with just a tad of chew to make them interesting. For me, there wasn't much flavor beyond that. Kind of plain, felt like it needed salt and pepper or something. Just not exciting. 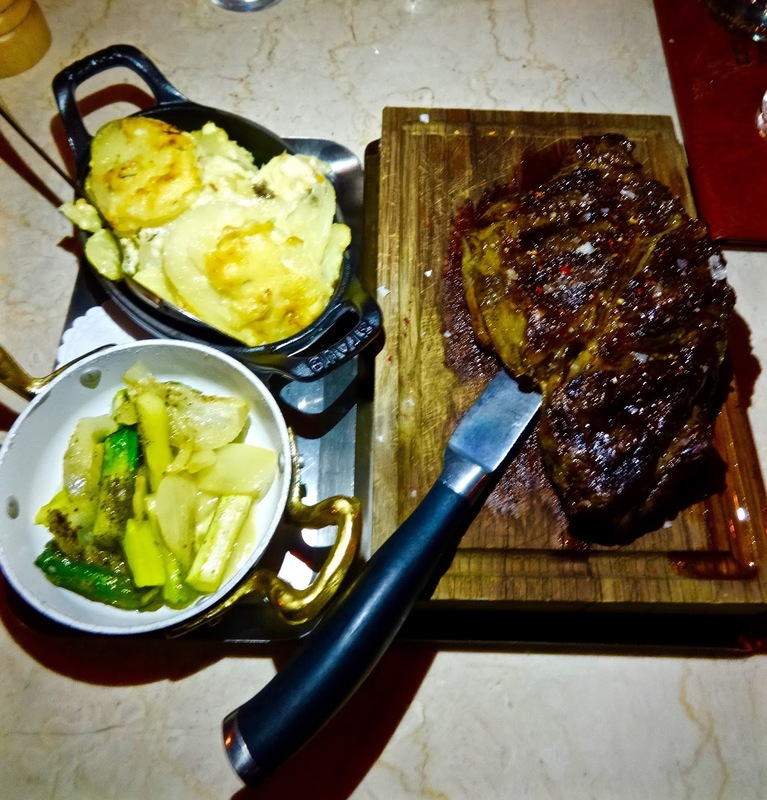 Wish I could have gotten a better a picture but this is the ribeye, which didn't come with sides so I ordered up some potatoes au gratin and asparagus. They didn't ask how I wanted my steak cook so I was guessing the did all meat medium rare, which was almost correct. It came closer to rare than medium but I was fine with that. It had a great char on the outside and was sprinkled with large crunchy bits of salt. A tender, juicy and flavorful cut of meat. The potatoes were pretty good too, not very cheesy but they added in some rosemary which was a nice touch. The asparagus was more like just a few pieces of it and mostly onion, though was I had was good, just wanted more. 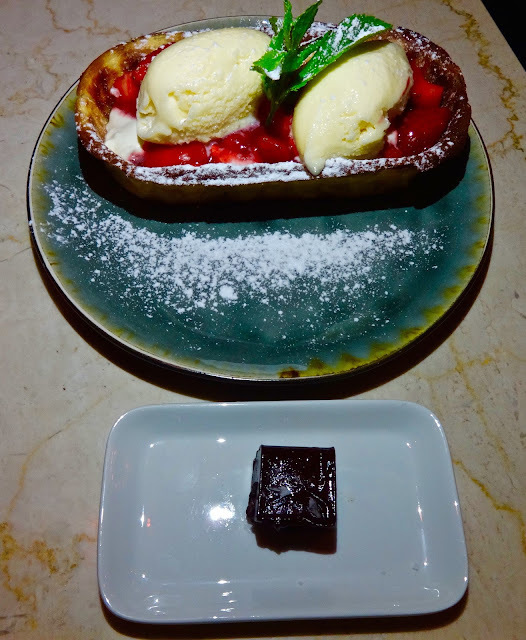 Dessert was an ice cream waffle and a petit four. These were actually two different ones from the menu. A crispy waffle boat thing with vanilla ice cream, strawberries and cream. Kind of like an ice cream cone just in canoe form. It was okay to me, it hit all the things the SO likes in a dessert so thumbs up from that side. I though the petit four would be more than one piece and something different than what I got. This was pretty much a piece of thick fudge dark chocolate with a sprinkle of sea salt on top. Again, for me, a little eh. Not much of a chocolate fan in this form, much prefer cakes and stuff. This was little too sticky and dense, not smooth like a fudge should be. Oh well, live and learn in a foreign country. For our first fine dining experience in Stockholm it won't bad. Much like restaurants back there were some highs and lows. But the lows weren't so bad that it detracted from the meal as a whole. The meat was the highlight here and if I was to ever go hear again I'd stick with the beef side as they seem to have gotten that down pretty well. I do think they could ratchet up the fish flavors a bit. One thing I would like to note about service, which seems to be particular to service in general in Sweden, is that it is a lot like their design--minimalist. They give you menus, disappear for a bit, came back to get your order, disappear again. Bring your food, then totally disappear till you flag them down for either a check or dessert. There really isn't too much interplay going on here. Probably a good thing since tipping isn't really a thing here either. I guess if you are ever in Stockholm and get a hankering for a hunk of meat Fiskbaren seems a good place to get it. It will even come with a side of hipster, making you feel right at home.